Stunning 3 bed detached bungalow in sought-after location in the coastal village of Toward. Set in a large plot, No 9 is in absolute walk-in condition and finished with top quality fixtures and fittings throughout and comprises three bedrooms (one with an en-suite and dressing area), spacious open-plan sitting / dining room, contemporary breakfasting kitchen with adjoining utility room and modern family bathroom. Externally, the property boasts large front and back gardens with many features such as a decking, barbecue and patio areas, outhouses, ample places to site tables and chairs to follow the sun and a large gated driveway suitable for numerous vehicles. This will undoubtedly make an ideal family or retirement home and is sure to be in demand so early viewing is highly recommended. The village of Toward is approximately 7 miles along the coastal road from Dunoon, Cowal’s capital town and offers lovely views of Cumbrae and Bute with Arran in the distance. In the Dunoon area there are two supermarkets, local shops and hairdressers aplenty, several cafes restaurants and take-aways, offering a range to suit all tastes and budgets, plenty of pubs, two leisure centres, numerous golf, bowling, tennis and sailing clubs, a two-screen cinema, a local museum and a concert venue. There are also ample schools, churches, medical surgeries, dentists, a hospital and a veterinary practice. In addition, there are two ferry links to Gourock with rail and coach links meaning that Glasgow city centre is little more than an hour away, with Braehead Shopping Centre and Greenock even closer. The Meadows is an exclusive estate on the shore road, just before the junction to Toward lighthouse. 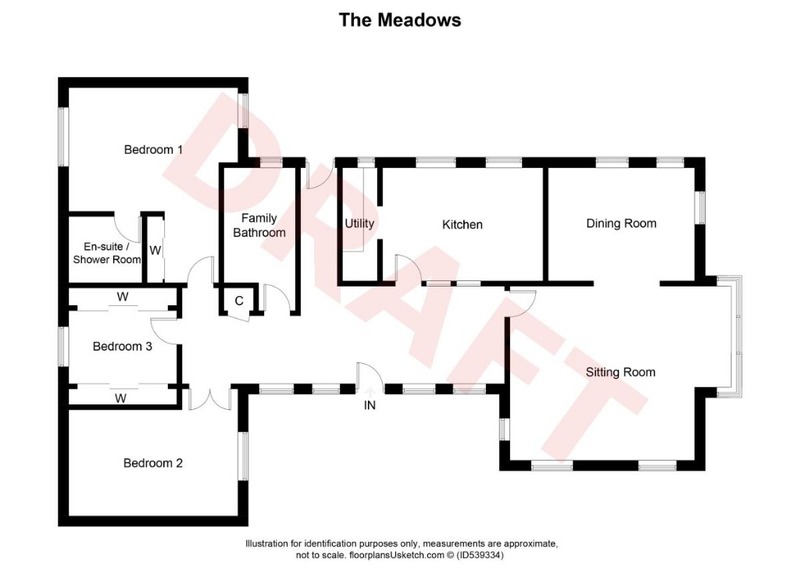 The property can be entered from the front gate and pathway leading to the UPVC door which is designed for wheelchair access or alternatively, from the rear garden where there is parking for numerous vehicles and a decking area which leads to the rear door. T-shaped hallway which runs the width of the house and provides access to both front and back gardens. Quality, and aesthetically pleasing, flooring and several windows to the front offering country views whilst also allowing plenty of natural light to stream in. Downlights with LED bulbs (a feature throughout the bungalow), radiators and storage cupboard. Spacious bright area with a large bay window looking south and another window to the west. Aberdeen Oak laminate flooring, downlights, radiators and semi-open plan with the dining room. With windows to the east and south, the whole area makes best use of available light and enjoys the summer sun well into the evening. The flooring matches the lounge, as do the downlights. Contemporary breakfasting kitchen which overlooks the back garden and also has a full height glass wall to the hallway. Cream wall and base units with timber side panels and slate-effect worktops. Ceramic sink, integrated white goods, gas hob with electric oven and extractor hood over and island breakfast bar with storage under. Off the kitchen and plumbed for washing machine with space for further white goods. Wall and base unit plus stainless steel sink with drainer. Modern 4-piece bathroom suite comprising WC, wash-hand basin, bidet and Jacuzzi bath. Fully tiled walls and floor, under-floor heating and window to the rear. Luxurious master bedroom with dressing area and full en-suite shower room. The bedroom area has carpet, downlights, radiator and windows to both sides whilst the Dressing Area (2.12m x 1.69m / 7’0” x 5’7”) has timber flooring and an in-built double wardrobe with mirrored sliding doors. The excellent En-Suite (2.02m x 1.89m / 6’8” x 6’3”) is finished to a very high standard and comprises WC, wash-hand basin and walk-in shower cubicle. Fully tiled walls and floor with the added bonus of under-floor heating. Good sized second bedroom with dual aspect, in-built mirrored wardrobes, carpet, downlights and radiator. Situated in between bedrooms 1 and 3, this room has a window to the side, carpet, radiator and downlight. Spacious gardens which envelop the property and have been lovingly, and thoughtfully, landscaped. The front is mainly laid to lawn but with plenty of colourful plants, trees and shrubs sprinkled throughout. The rear garden is made up of various seating areas including an elevated decking, lawned sections, drying area, handy sheds and a spacious parking area for numerous vehicles. The whole garden is enclosed with a picket fence and appropriate pedestrian and double gates.